Today, I’m excited to share an interview with author Jennifer Acres. Her debut novel, On the Way to Simple, hit virtual bookshelves today! I’ve known Jennifer for a few years, and she’s an awesome writer, and as generous and friendly a person as you’ll encounter. 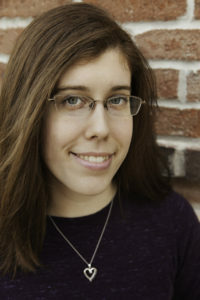 In our interview, she shares some of the background to her novel, her writing inspirations, and — of course — her Hogwarts House. Be sure to check out her web site, and pick up On the Way to Simple on Amazon. Dan from EarnThis.Net: Hi Jennifer! Thanks for taking the time to share with us a little bit about your debut novel and your background as an author. Jennifer Acres: Thanks for having me! D: Your novel, On the Way to Simple, is a new adult romance centered around protagonist Dakota Ames. What can you tell us about Dakota? J: Oh where to start! Dakota is strong-willed and a planner to the point of annoyance to most. She’s seen as a control-freak, but as you get to know her, you see she has a very definite reason for being this way. There are a few people in her life who have seen through this tough mask she wears, and she is fiercely loyal to those people. D: Who are some of your favorite characters from the story other than Dakota? J: I love Kaylee so much it hurts. She is basically an amalgam of my favorite people in life and I can’t get enough of her. I’m also really attached to Alex and Will – both for different reasons which I can’t say without giving too much away. Will is super swoon worthy and I had a blast writing him. And Alex has this silent strength that is so comforting. D: I’ve been wondering about the title: On the Way to Simple. It suggests a theme of characters struggling complicated and ambiguous obstacles. Names and titles are really difficult for most writers; how did you come up with this name for your story? J: Oddly enough, the title is usually the easiest part of the story for me. It’s the first thing I lock in and it acts as a lighthouse for me as I’m writing. OTWTS was the exact opposite! I had a different title early on, but as I wrote, the story diverged too far from the original title to make any sense. So I sat down with a legal notepad, picked a few thematic words, and used those to write pages and pages of names. But as soon as I hit On the Way to Simple, I knew this was it. I think that one showed up on the eighth page of names. D: The story has a major plot element of characters coping with loved ones enlisting in the military. Is this something that you’ve drawn from your own life experiences, or is it one that you discovered in the process of writing this story? J: This story does come from personal experience. I have several members of my family and friends who serve in the military or as first responders. It’s rough. There is an inherent amount of danger that comes with these jobs and, when it’s someone you love, you can’t help but worry about them. I wanted to shed a bit of light on what it can be like for these families. Everyone has different experiences, so this does not reflect all military and first responder households, but I put a fair amount of what it was like in mine. J: Enjoy a gripping story about flawed people trying to make it the best they can. These characters go through hell, so if you like books you have to purchase kleenex with, this one’s for you! D: Your previous career experience is writing for the screen. What drew you to start writing prose fiction? J: I love that you can basically crawl inside someone’s head in a novel. That is what drew me to story in the first place. I wanted to be able to help people see inside the minds of people they might not understand in real life. They say those who read are proven to be more empathetic and I absolutely believe that! When you see how someone different from you thinks, you begin to understand them. You find common ground and new insights. That’s something I found much more difficult to do in film – at least, it’s much harder to sell a script that seeks to do this. D: I’ve had the pleasure of participating with you in writing challenges like NaNoWriMo and Camp NaNoWriMo. How much have those events helped and inspired you to work on your fiction craft? J: They absolutely have helped. In fact, OTWTS was my NaNoWriMo project in 2015. It’s not just the accountability and goal setting, though. I found an awesome group of writer friends through these as well. For the years that I don’t do NaNoWriMo, I actually use them as a kind of yearly check in for my writing habits. So whether I participate or not, I’ve always found wonderful inspiration and friends that help me each and every day. D: What pieces of fiction — written, filmed, or otherwise — serve as your biggest inspirations? Are there any in particular you drew on when writing On The Way to Simple? J: This is such a tough question – it changes daily! I actually seek out a wide variety of things to keep me inspired. Usually, I read/watch more in the genre that I’m currently writing in and I pick out elements from those. For OTWTS, several Colleen Hoover books and One Day by David Nicholls were big inspirations. But I’ve also been reading and watching a lot in fantasy/action/superheroes as of late, which is probably why my next project is more in the Buffy the Vampire Slayer or Supernatural arena. D: I know that your husband is also an author. What can you tell us about him and his work? J: Yes he is! He’s writing an urban fantasy series called “Urban Legend” that’s fantastic. It’s an alternate history story about a young girl who illegally manifests magic. She ends up caught between a government agent and the heir to the ruling house of Vampirum and all kinds of craziness ensues. The first in the series “Orphan” is out on Kindle already and he’s hard at work on the second and third installments. You can find him on Amazon and Goodreads as J.P. Dailing. He’s just an amazing author and the best husband ever, so I got super lucky! D: Your author bio mentions that you spend a significant amount of time “following your fandoms.” What are your biggest pop culture obsessions recently? J: I’ve been on a serious Marvel kick recently (Team Cap!) and I love Sherlock and Doctor Who. But my biggest nerd-outs are from Harry Potter, especially since Fantastic Beasts and Where to Find Them is giving us Hufflepuffs our hayday! D: Lastly, and most importantly: Your author bio says you’re located in Houston. What are your top restaurant recommendations in the area? J: Ooh food, my favorite subject! My top pick has to be Japaneiro’s because their sushi is seriously amazing. And just the other day, I found Harvest Market (gluten free and vegetarian friendly) and had the best Kobe beef burger I’ve ever had. Also, we have a movie theater that serves a full restaurant menu while you watch. It’s called Star Cinema Grill and it’s awesome! 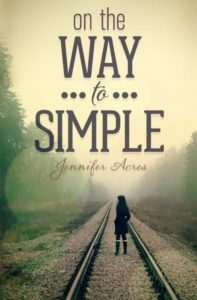 Be sure to stop by Jennifer Acres’ web site and pick up On the Way to Simple on Amazon!